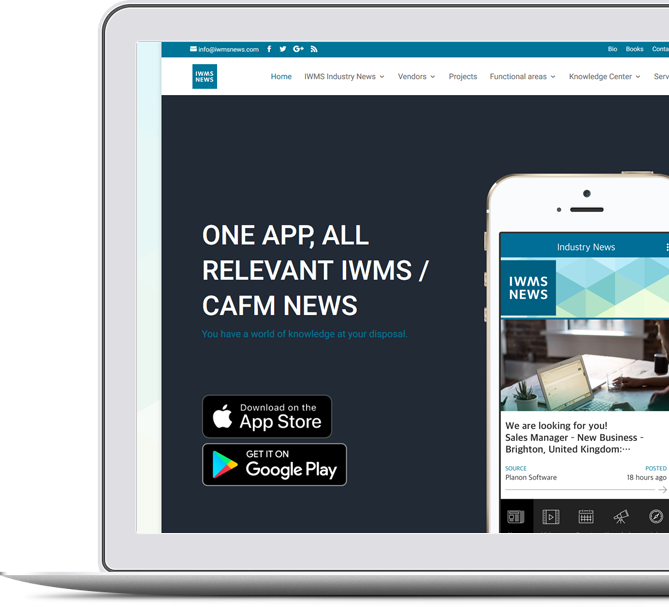 We strive to provide you only with the most relevant IWMS and CAFM news, articles and blogs. Get the latest IWMS and CAFM Industry News. We try gathering the most imporant news for you. You want IWMS videos, testimonials, training? Your request is our demand. A section dedicated to videos. All relevant industry events will be available under one button. E-books, Whitepapers, Case Studies and other relevant material will be available through our Knowledge Center. Always wanted to work in the IWMS industry? These jobs are available! Yes, we aim for the stars! Instead of you filtering out all relevant IWMS / CAFM information we have done this already for you! You have a world of knowledge at your disposal. All you need is a mobile device. We have optimized our app for IOS and Android, but we would love to welcome you at our website too! Become a member of our IWMS / CAFM COMMUNITY! exclusive content only available to our members! Complete the form below by entering your first name / last name and email address. Check your email and confirm your registration to start receiving exclusive content. You are done! After you have confirmed you will start receiving exclusive content free of charge. Of course you can cancel at anytime.